Cucumber Melon Handmade soap has a fragrance with crisp cucumbers and juicy, ripe melons with gorgeous green and peach swirls. Lots of creamy gentle lather for the face or body. 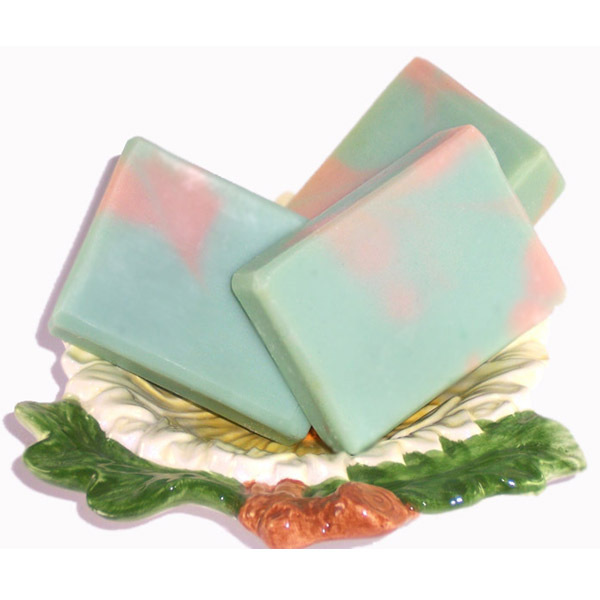 Cucumber Melon Artisan Soap is scented with crisp green cucumbers and ripe, juicy melons. The coolness of the cucumber and the sweetness of the ripened melon marry beautifully in this soap. Enjoy the crisp and fruity scent in this rich artisan soap with lots of creamy bubbles. Each bar is made with peach and green swirls and is unique. My soaps are made with natural ingredients like virgin olive oil, coconut oil, castor oil for bubbles and superfatted with mango butter. This creates a mild soap that’s gentle on your skin. This soap will leave you refreshed, pampered with a silky skin feel. Each bar is packaged in a soap box with a cut out to protect it until it gets to you. Each of my soaps are made here in Palm Springs, California. Once you try handmade soaps, you won’t go back to the grocery store bought soap. Handcrafted soaps are a luxury at an affordable price tag. Buy this Cucumber Melon soap for its natural ingredients and how silky your skin will feel after any bath or a shower. Ingr: Olive oil, Coconut, Palm Kernel, Mango Butter, Castor oil, Soybean, Sodium Hydroxide, Beeswax, Sodium Lactate, Fragrance, Mica, Green Oxide, Pink Clay.